Stand facing a wall with your hands on the wall at about eye level. Put your affected leg about a step behind your other leg. Keeping your back leg straight and your back heel on the floor, bend your front knee and gently bring your hip and chest toward the wall until you feel a stretch in the calf of your back leg. Keeping both heels on the floor, bend both knees. Then gently bring your hip and chest toward the wall until you feel a stretch in the calf of your back leg. Place a book on the floor 8 to 10 centimetres from a wall or countertop, and put the balls of your feet on it. Your heels should be on the floor. The book needs to be thick enough so that you can feel a gentle stretch in each calf. If you are not steady on your feet, hold on to a chair, counter, or wall while you do this stretch. Keep your knees straight, and lean forward until you feel a stretch in each calf. To get more stretch, add another book or use a thicker book, such as a phone book, a dictionary, or an encyclopedia. Bend your knees, and lean forward until you feel a stretch in each calf. Sit with your affected leg straight and supported on the floor. Your other leg should be bent, with that foot flat on the floor. 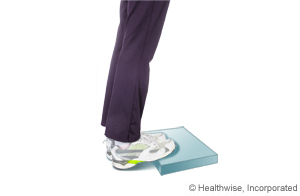 Keeping your affected leg straight, gently flex your foot downward so your toes are pointed away from your body. Then slowly relax your foot to the starting position. Keeping your leg straight, gently flex your foot back so your toes point upward. Then slowly relax your foot to the starting position. Stand on the bottom step of a staircase, facing up toward the stairs. Put the balls of your feet on the step. If you are not steady on your feet, hold on to the banister or wall. 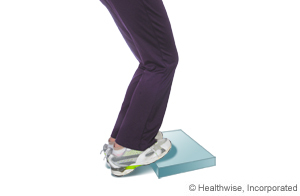 Keeping both knees straight, slowly lift your heels above the step so that you are standing on your toes. 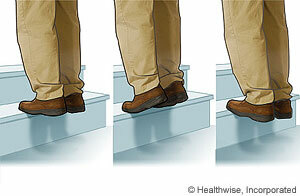 Then slowly lower your heels below the step and toward the floor. Return to the starting position, with your feet even with the step. Enter S834 in the search box to learn more about "Calf Strain: Rehab Exercises".